I haven’t blogged in a few days while investigating the odd features of the Egyptian-Libyan Sahara. 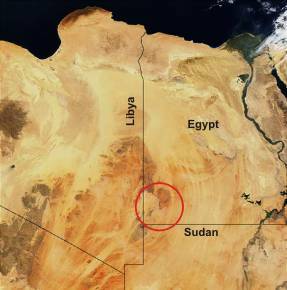 I first started poking around this subject following the announcement of the fresh and appetizing Kamil Crater in the central-western Egyptian Sahara. This got me to looking into the subject of other purported craters in the Sahara. I had no idea that a controversy has brewed for years on the subject of Sahara desert craters. Well, now that I have dug in, as usual more questions have appeared than answers. These suckers are weird. The two explanations seem to fall, as usual, on the two poles of natural understanding: Ancient basaltic plugs slowly eroding over millions of years; or slam, bam, thank you ma’m encounters with space borne material in relatively recent times. Not much middle ground there, as usual. Or is there? I am undecided but lean toward a terrestrial explanation until otherwise persuaded. And thus I am interested in the opinion of my compatriots. E.P., Dennis, Mike, Rod, Terry, Pierson, Bob, et. al., are some of the weird craters and circular features related to explosive hell from above, old lava from below or….both?